This is a beta release of our upcoming v6 of the Evernote for Windows client. The whole team is very excited to show you what we have been working on and testing in closed beta last month. Evernote for Windows v6 is an overall improvement to the Windows client. It is focused on what defines the core experience of Evernote: navigation, organization, search, note editing, note browsing. You can download the Evernote for Windows v6.0 Beta here. After familiarizing yourselves with the new v6, we’d love to hear your feedback through this survey and your comments in this discussion. We hope you enjoy the update and look forward to your feedback! The app now looks crisp even on ultra high resolution screens. No more blur from OS scaling. The Search bar is now in a more natural place, at the top of your note list. Search and refine your results even faster with a clearer search description of the results shown. Search now extends to your entire account and suggests refining/expanding your search to help you find the notes you are looking for, even if trashed accidentally. Cleaner and brighter overall interface. Larger native note scrollbars that are easier to drag on touch screens. Notebooks and Tags organization: easily navigate, create and organize all your notebooks and tags directly from the Left Panel. Thin navigation bar: turn off the left panel to give more space for your content and still keep key navigation items. Easier access to trashed notes to recover past notes. Note titles now remain at the top and no longer disappear with scrolling. Quickly jump to notes within the same notebook or with the same tags, when viewing a note. Add code block in the editor, to better display code snippets. Toggle the formatting bar on/off for a cleaner experience when only viewing notes. Right-click on a specific notebook or tag to define a color. This styles the notebook or tag in the Left Panel to make it easier to find. Specific notebooks, such as default notebook, notebooks you have shared, and notebooks shared with you, are now called out in color. The default style can be overridden. Notes tagged with a styled tag will also be visually called out in the note list with a colored tab. Business Notes, Notebooks, Tags and Shortcuts are now visually separated from Personal ones. Choose your context and hide distracting content. There are no more mixed note lists. To prevent accidentally moving notes, transferring notes from business to personal is now an explicit right-click -> “Copy to Personal”. Similarly for the other way around. Stability and performance improvements. The app runs faster. becomes this in MS Word. The checkbox is replaced by Error! Filename not specified. Behind what you see in notes, Evernote uses an extended form of HTML code called ENML. I can understand if some custom items (like checkboxes) get messed up in translation to other apps. I agree with many of the replies here, in that the UI is too white, bland and boring. I'm also surprised that headings (H1, H2, H3, etc) aren't available as part of the formatting options. I have home set as my default notebook and I routinely like to go through and assign new notes with either tags or different notebooks using a search like -tag:* notebook:home to show all untagged notes in my home notebook. However, this no longer works in 6.x beta. The -tag:* is working but the notebook selection isn't (I have to manually select the Home notebook and only use the -tag:* in search). Also, will there be a way to save searches in 6.x?. Just set up several test tags because I had temporary problems adding any tags to notes. Highlighted the test tags to delete all of them, but only the last one was deleted. It appears tags can only be deleted one at a time in the left window. Plus Evernote crashed without any error messages when I clicked on the next tag... ??? Evernote re-appeared after I sent the report, repeated the 'indexing your database' message. Highlighted and deleted the next tag in the left panel - and the focus jumped to Notebooks. Scrolled down again and repeated with another tag - focus jumped again. Tried multi select again - still only deletes one; but at least the app didn't crash this time. Maybe, but this is new behavior that started with the introduction of the new editor code. It worked fine earlier. When the new editor first appeared the checkboxes were just ignored and not copied over. This error message appears to be new with this beta. Don't know if this has already been reported but there are still major issues with touch interface. The note can't be scrolled with 1 or 2 fingers in the normal way by touch (I'm using a Surface Pro 4). The Notes list can be scrolled with 1 finger, but the scrollbar doesn't seem to be selectable by finger touch. The note itself can be scrolled with 2 fingers but only using a really weird technique I learned for 5.x: you have to hold one finger on the screen, then drag a second finger vertically below the first finger. This works but is strange. Dragging 2 fingers or holding 1 finger in place and dragging a second finger horizontally next to it won't work. It looks like other features are being added that use hovering which isn't usable by touch. I'm not necessary advocating a touch first interface, but it would be nice if features could still be used by touch through menus or alternative methods. At least the basics such as scrolling should work, though. At least the wider notes scrollbar, which doesn't work with touch, is now workable with the stylus. Evernote is there to Remember Everything! Unfortunately, one on the things that bugs me a lot is that Evernote clients forget a lot: window size, open notes, settings for individual notebooks, etc. Every time that the app(lication) is started again, you're stuck with only a bit of information from the last time that it was open. I imagine Evernote as a platform where my thoughts and bits and pieces of work and life are around all the time. I use different view settings for specific notebooks; for example for a tasks notebook I want to see a list with specific columns and sort order that is useful in this context, but for a notebook with lots of pictures I prefer a card view with other sort settings. Let me open multiple notes, maybe in tabs, and bring them up again when I return. Browser usage tells us that too many tabs are more evil than good, but having none is not an option, either. We should rather find better ways to organise them and to remember what we were doing when we left. The idea of an updated desk-top metaphor where you have all your important notes and notebooks sorted out neatly and persistently comes to mind.Does this make sense to you? Evernote re-appeared after I sent the report, repeated the 'indexing your database' message. @gazumped I could not locate your crash in our database, so it would be very helpful if you could forward it directly. Clean, fast, and enjoying new navigation options. 1. I was hoping to be able to select which Notebooks to sync to my PC (similar to that capability on iOS). As PCs go from huge hard disks to SSD drives (mine is 128 GB), I really need that functionality. As a Premium customer, I'm allowed to upload 120 GBs each year: however, I cannot take advantage of that because my database wouldn't fit on my PC's SSD drive. * shows "Move Note to Trash" ~ why not simply name it "Delete"? * is there an eraser? I haven't kept all of the crash logs, but if you need more call stacks let me know. This would be brilliant. All the other features mac users have would be brilliant. Ugh. Get rid of some white space. Seriously. I know a lot of people who are not happy that Evernote uses a lot of it. Now the whole thing is white. Yes, the UI is brighter but it's just too hard on the eyes. I'm still going through it but the UI color is really bleh! "Selective Sync" is what I expect these days from a cloud service and not only on mobile where it is obvious. Devices some in all sizes and if Evernote wants to be ubiquitous that it has to respect that "download everything" is not the solution. Premium use will drive Evernote into a flexible knowledge and document mangement system that should honor that the mode of access to this wealth of information will have to adjusted to the respective device just used. I have a problem which existed already in earlier releases. Works but the active note window is not displayed!! Only when i startup the then active note is displayed correct. Dubble clicking on the note gives new window with correct content. Could this be looked after? Would be great if this can be fixed so that many Linux users can use the native Evernote client there! After having lots of crashes over the last week, I turned off the note panel and did some of the things that were associated with crashes. Since turning of the notes, I have not had a single crash, in several hours of doing some housekeeping on the 15000+ notes that I have. I have some more things to test out, but things are going much faster, and with less cursing, than before. The searching for words in text is still incredibly slow, but searching for tagged items makes that somewhat redundant. I will update this post if I find any major problems with my approach, or if I can use anything other than the list view to get things done without crashes. Windows client does not have this yet, however you may want to try experimental Partial Sync feature: if enabled, only the notes you are viewing are down synced from the service. The downside is that since other notes' content is not present locally you cannot rely on search to find them. Notebooks/tags/shortcuts and scrolling is what you rely on to find notes in this mode. I'm using it on a few devices with limited SSD space and it's still useful. To enable this mode, you need to set HKCU/Software/Evernote/Evernote/EnablePartialSync to 2. Appears to be exactly the same issue as @gazumped reported. Please post Developer Info lines as suggested above to make sure its already fixed. After having lots of crashes over the last week, I turned off the note panel and did some of the things that were associated with crashes. Since turning of the notes, I have not had a single crash, in several hours of doing some housekeeping on the 15000+ notes that I have. I have some more things to test out, but things are going much faster, and with less cursing, than before. When the next beta is out, please consider turning the note panel back. If it still crashes, please go to Tools/Options/Context and uncheck [X] "Show context" to see if this helps stability and performance. Are you talking about Search In Note (Ctrl+F) or Search Notes (F6) ? In List on the side view, no left panel, search explanation visible, all notes. I hit the plus sign to enter a tag and the search results are accurate but there is a tag not involved in the search displayed in the search explanation. In simple terms I search for tag1, the search results are accurate for tag1, but the search explanation displays tag1 and tag2. I can x delete tag2 and the search stays the same. Also, posted before, but is there an alternative to Shirt-Alt-T for multiple tag searches? Is this the bug referenced in the original post? It is a major PITA to have to continue to click the + sign to do a multi-tag search. Otherwise, getting used to the look and feel and like the speed improvements. Good stuff! We have seen this reported before, however could not reproduce here. It would be great if you could provide steps to repro this problem reliably. Shift+Alt+T is back in the upcoming beta. We've also added Shift+Alt+N which does the same thing but for notebooks. Thank you! Upcoming beta has more speed improvements, so please stay tuned. Did you re-index by using Ctrl+Help/"Recreate Full Text Search Index" without holding down Shift key? If so, try holding down Shift key when clicking on "Recreate Full Text Search Index" -- this will rebuild full text search index from scratch (as opposed to re-indexing in-place). This resulted in substantial search performance improvements for many users. The next beta will do this for you automatically when it is installed. For some reason I couldn't get the quote to work, so I will respond normally. I didn't know about the shift key, so I am trying that now. It will be tomorrow before it finishes, I suspect, given the number of notes I have. Edit: Have not been doing many text searches, but it does seem to have improved the search speed. I guess it's because of the size of my database. BTW, it would be useful to have some indication of the progress with re-indexing, without having to go to the activity log. Shift+Alt+T is back in the upcoming beta. That would be enough for me to try the Beta on my main PC. Every time I go to all notes, hit the + sign for tag search and type sta<Enter> (Statement is the only tag after sta) I get the right notes but with an added tag in the search explanation. Also it becomes an ANY search. If I add a tag at this point, the search becomes an ALL search for the three tags and I get no results. If I click on the x for the unwanted tag , sometimes it takes TWICE, it is removed from the search and the results are now accurate for the two tags I entered, and it is back to an AND search. I can add a third tag at this point and get the right results. NOTE: I tested this a few times and it worked per the above the first two times. After that EN just crashed. I sent three crash reports. Then it started working per the above again. Also as an FYI, the unwanted tag that gets added to the search is a tag that is only used on notes in my local notebooks. My test system does not have any of those notes, only my synced notes. I added a dummy note and added the unwanted tag, but that made no difference. If I enter the second tag first everything is fine. But when I enter Statement as the second tag, the unwanted tag appears again and the search changes to ANY. I can x the unwanted tag but the search is still ANY and I have to select ALL. I have tried different tag combinations, but the issue only seems to happen only when I enter the tag Statement. So, something to do with my Statement tag and the switching from AND to ANY are issues. Hope this is somewhat clear. It is repeatable for me. PM me if you need something. Currently running two databases - one premium, one basic. The basic account window closed, but the prem account did not start. Attempted to start Evernote again from the desktop icon - got the Fatal Error window again. EN will probably restart fine after I send this note. I hope. Error report sent. ...and here we go. Still on the free account. Switch works this time. It's a little nervous-making that it's a blank white screen - no notes visible...while there's a sync going on. 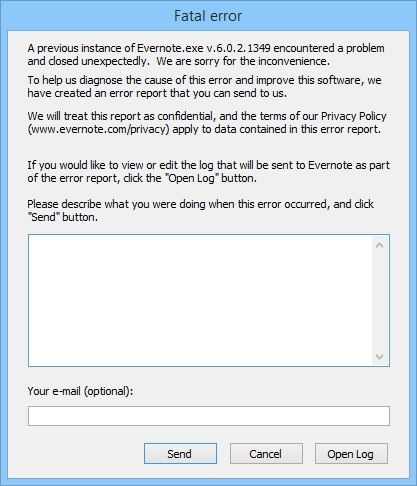 Evernote not responding. That lasts for 20 seconds or so and then we are back. 1) When copying text within a code snippet and then pasting it, the pasted text jumps to the line above and pastes there instead of pasting where the cursor is located. 2) Pastes don't maintain the original formatting. I don't know if that's a bug or intentional but I feel that it should maintain the original formatting or at least give a pop-up option (like in MS Word) to maintain the original formatting or paste as a non-formatted snippet. See the attached gif for examples. First I copy the word "world" and attempt to copy it to the right of the word "universe" but it pastes above. Second, I copy the colored line and paste it below where they paste without the original format. I paste "Note Links" into Windows Office files. While using Evernote Windows client on my PC, when I click a link in Excel it opens the note in Evernote web (if I'm not logged into Evernote in Chrome, it still tries to open it there). I want it to open it in Evernote Windows client. It used to work like that... has something changed? Hold down Ctrl key when clicking Copy Note link to get the old behavior. Thanks for the guidance. From my PC's Excel app, it takes me to the Evernote Windows client: but when I open the Excel Online and click on the link, I get this message "Sorry, we couldn't open this link. The link address may be invalid, or you may not have permission to open it." What do you suggest? Sometimes when I single click on a "shortcut" to select it, the "shortcut" disappears: it's happened to various "shortcuts". Not a huge problem: I just go down into my "tags" and create a new "shortcut". Has anybody else experienced this? Regular Copy Note Link creates an https:// link that could be used from web apps, Ctrl+Copy Note Link create an evernote:// link that can only be used locally. You have to choose one or the other depending on how you intent to use it. Thanks Peter. For a long time (in previous versions): I would copy Regular Copy Note Links into Office docs. Even when I would click on the link in Office Online, it would first open an Evernote tab in Chrome then jump automatically to my PC's Evernote client and select the note I wanted. Sometimes when the Evernote tab in Chrome would open, I would get a message something like 'do you want to open the note online or using your Windows client?' Is that no longer going to be the case with this new version of Evernote? Just tested it here and your scenario works exactly as expected: pasted a regular note link into a Word doc and clicked on it, Chrome window briefly appeared then the note was opened in the native client. I'm not sure why it is not working for you, please contact customer support to see if they can help. I noticed that when I search for notes using more than 3 words (not tags), selecting all notebooks, Evernote starts to show Not responding and freezes the app. Is it a known issue? thanks for attention. It's always been happening to me, since I got over 100 notes. It's so annoying. it seems that every word I type, the evernote makes a search but at the same time he freezes the screen. it becomes a boring situation. on the final version, the issue was solved. Thanks!! Just reporting a bug that's extant from v5.x, since maybe several months ago. It's very simple to reproduce (and very annoying): create a text line that has a todo checkbox at its start. Now select, copy and paste the line elsewhere. Notice that the pasted todo checkbox now has a box around it. We've repro'ed this. Will try to get this in for the final release of 6.1, thanks for mentioning it! * Note Panel on right hand side (not underneath). This used to be easy with Ctrl-Shift-F5. Now it seems you can have one of the above but not both. Now I cannot find any way using Ctrl-F5, Ctrl-F6, Ctrl-F7 and all the other FN keys with Ctrl or Shift. Ctrl-F11 for no note view and Ctrl-F8 for side list view. F10 to hide the left panel. See the View menu and the drop down to the left of the search bar for other options, some of which changed with V6. Perfect! I had missed that little rectangle next to the Search bar with the different View options. Many thanks indeed. even the "new note" button is hard to spot despite the only effort of making it non white ! this interface is just a joke. May be the below, my toolbar. I don't know, kind of obvious to me since new note is the only colored icon. Interesting ... I was not seeing this so investigated a little. There is both a new note icon (text only note) and a new note with down arrow icon which allows you to select the type of new note you want. I've always just had the one with the down arrow which doesn't have color. Never noticed the "other" new note icon before. I have no need to select the type of note so switched to the color icon instead. Thanks for mentioning this. Yeah, I go full Star Trek, icons only. All steps in the right direction, great to see these! Simplifying but not making the functionality any simpler is exactly what you should be doing! Lastly, I know windows 10 has adaptive layout support, but I imagine only certain codebases and ideal for new applications etc. But is this something your teams have looked into for a release farther out? A great way to see this in action, and feel for writing things etc like Evernote, would be with the windows 10 mail app, how it adapts its 3 panes and editing areas.